The homes in Heritage Hunt were built to code. The problem is that “code” does not mean “comfortable.” Built to code means the home was built to the safety standards set forth by the local municipality. Unfortunately, the local municipality can currently only set safety standards, not comfort standards, resulting in inefficient homes that are drafty, uncomfortable, and the responsibility of the homeowner to correct. Gable vents in Heritage Hunt are ornamental only, they have no purpose. In effect, the gable vents in your home are nothing more than a 2-foot hole in either side of your home that was beat through the wall with a hammer. In some cases, they have not been open to the interior spaces, other cases have. Insulation baffles placed by the building contractor in the eaves of your home are made of cardboard. These are designed to keep the blown-in insulation out of the soffit vents, promoting air flow to the ridge vent on your roof. Unfortunately, these can fail, causing the soffit vent to clog with insulation. Furthermore, once the soffit vent is clogged, its purpose has failed, moisture can set in, and that brings mold and mildew. force air into your attic space—pressurizing it. Blown-in insulation in the attic space over living areas is exposed to too much wind, suffers wind damage and is redistributed. This can leave some living areas uninsulated. for your house to breathe. Seals the home from drafts from the inside out. 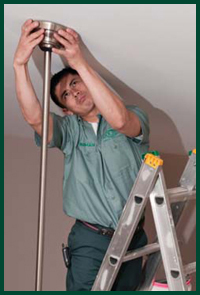 Corrects any anomalies involving the attic insulation and baffle materials. Corrects any air flow issues in the attic space while still allowing the proper air flow required for your house to breathe. Only taking care of one, or just some, of these issues will not solve the entire problem. Consider your house like a hose with multiple holes in it, if you block one hole the pressure increases at the other holes. Only once you have all the holes sealed will the problem go away. Blown-in insulation used should be cellulose based, treated in Borax to set fireproofing. It should have a higher “R” value (the insulating value of the material) requiring less material to be used. Insulation baffles should be larger, with locations securing the baffle to the roof sheathing itself, and should be made of a material that will not degrade when exposed to moisture, preferably with its own “R” factor. The tax credits that were previously effective for only 2009 have been extended to 2010 as well. The tax credit has been raised to 30%! If you buy $300 worth of materials it will only cost you $210 after you take the $90 (30%) tax credit. This is money straight off your taxes. Raised from $500 to $1500 for the two years (2009–2010). Must be for taxpayer’s principal residence. Service must take place between Jan. 1, 2009 and Dec. 31, 2010. 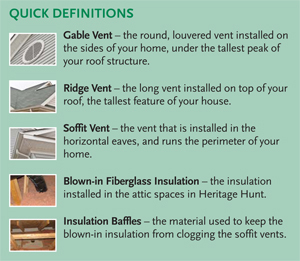 For any service to qualify, its primary purpose must be to insulate (reduce heat gain or loss). Installation costs are NOT included. If installed by a professional installer, you will need an invoice with the cost of materials and labor separated. Improvement must be expected to last for more than 5 years. Must have a Manufacturer Certification Statement. Save a copy of the Certification Statement with your tax records. You do not need to send a copy with your IRS Tax Return. Improvements made in 2009 will be claimed on your 2009 taxes (filed by April 15, 2010) — use IRS Tax Form 5695. ~ E. & L. M.
“After the project... (My wife) was moving things around in the attic, and had to call down for a flashlight because since we had the work done, the attic was dark, proving the sealing of the major air flow. Our house is quieter now... Our neighbors agree. Their house was too after their project was done. ~ B. & P. S.
~ K. & L. S.